GNU/Linux users are well aware of the fact that many pieces of software commonly used in Microsoft Windows, do not function for us using things like WINE; and so we must find alternatives to use. Granted, you could use a virtual machine to run Windows, but as I have encountered and I am sure others as well; not everything runs smoothly when you go down that route. One example using my laptop was that Adobe Premiere for video editing was extremely challenging to use in a Virtual Machine due to resources...So, what options do we have? Windows users most commonly tend to use Microsoft Office; but there are alternatives for Windows users as well for those who don’t want to pay for MS Office, or simply would rather use free and or open-source software. Thankfully for GNU/Linux we have alternatives as well, and they are some of the same ones available for Windows. The first one that springs to my mind, is LibreOffice. LibreOffice is a fork of another now discontinued suite called OpenOffice, which in itself was an open-source version of StarOffice, owned by Sun Microsystems. I only ever have made use of Writer; I am as we speak, but I am told that the other pieces of software all function with very similar features to their proprietary counterparts. 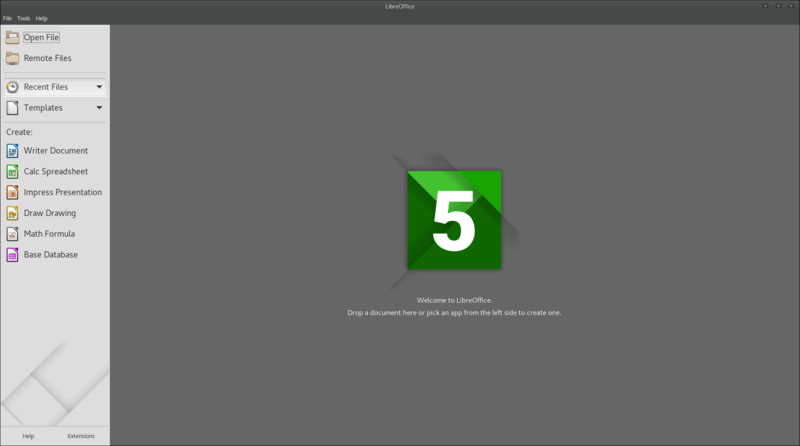 LibreOffice is fully compatible with almost other major suites including MS Office in terms of file formats, so users should have little to no issues with cross compatibility. Adobe Photoshop, oh how I love you...But it doesn’t function from my experience entirely properly using WINE in GNU/Linux. Regardless of what major version I have used, I have always run into an issue that I can’t work around, and so I’ve become quite familiar with another tool: GIMP. GIMP, or the GNU Image Manipulation Program, is exactly what it says. It has many features that digital artists, photographers and graphic designers will find useful, as well as the ability to handle installation of new brushes much like Photoshop. Now, it doesn’t have ALL the tools that Photoshop does, so users must find and learn alternative ways of doing things, but overall GIMP is a powerful program nonetheless. Another alternative is Krita. Krita began as a Qt based interface for GIMP but later became its own entity. Krita is most commonly used for digital painting, rather than photo editing though, so you might find it more common to be used amongst graphic designers rather than photographers. In Windows there are more music players than you can shake a stick at, and GNU/Linux is no stranger to this concept either. There are copious different players, each with their own set of features. The ones I use most commonly for playing local MP3 files are Clementine, and Banshee. 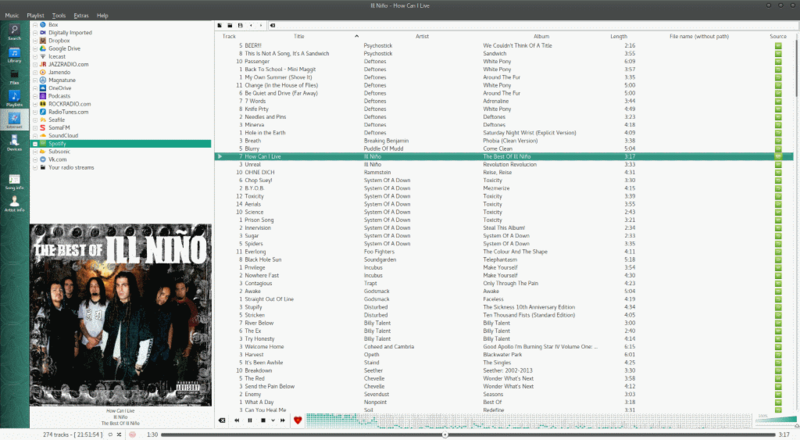 Clementine is a port of the old Amarok 1.4 music player over to the Qt framework. It was created after Amarok moved to version two, and the changes that it went through that many users did not find appeasing to them. Clementine has a minimalistic and simplistic interface that I quite enjoy, and has integration features for numerous online services such a Spotify even. Clementine is available for MS Windows and MacOSX as well as GNU/Linux. 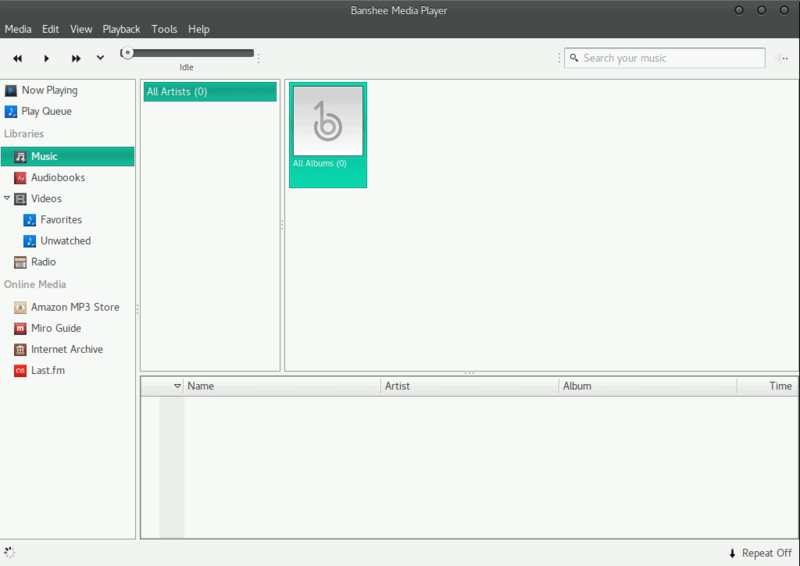 Banshee is another player I adore; it uses Mono and Gtk#, has a great interface, a plethora of features and plugins (although I believe Clementine has more), and is quite powerful. I tend to find myself bouncing back and forth between the two, unable to just stick myself to one. I personally don't use Apple devices currently, although I have in the past; so I have had to make use of alternative means of putting music on my device from my laptop. I found myself doing it via Amarok and Banshee when it came to syncing music; but there is another application that I found later on that caught my attention called gtkpod. Reading your existing iTunesDB -- Imports your playlists, play counts, ratings etc. I have not personally used it, so I can't vouche for how user-friendly it is, but with the features listed above and more; I can say it's worth looking into for those users who could make use of it. GNU/Linux is often criticized for it's incompatibility with many pieces of software and making its users jump through hoops to do things sometimes; but there are many user-friendly applications available nonetheless for users to complete their day to day tasks. What about you? Any alternative software you commonly use? Mike takes a look at software that Gnu/Linux users have at their disposal as alternatives to Windows software not available on Linux. The author is wrong, OpenOffice is not discontinued, the latest stable version (4.1.3) was released about half a year ago (https://www.openoffice.org/development/releases/). They don’t have the team they need to be able to make required fixes in a timely manner. These are some of the major reasons why I can’t use GNU/Linux full-time and consider it a comfortable computing experience. The only thing I really miss from Linux is the lack of a MAX_PATH limit. Whoever coded that into Windows all those decades ago should be ashamed of himself. It is without a doubt Windows’ Achilles heel. You can’t even develop in node.js because of this stupid limit. Even copying certain directories from an NAS to Windows fails due to this retarded limit. makemkv (which I use a LOT) is not a replacement for anydvd especially when you use clonebd with anydvd. anydvd (and clonebd) allow you to make a full iso file of the media to be……backed up…. on bluray I create the iso using clonebd and then work from the iso, depending on video often just create mkv using makemkv but if ts something i don’t want full bitrate I will use handbrake to create smaller mkv from the iso. all for backup purposes of course. 4. IDM is just damn good at capturing all types of video streams effortlessly. Flashgot’s stream parser is not as robust but it does work in most cases with some adjustments. 5. Neural-enhance seems to be very different from madVR. It’s primarily meant for still-images whereas madVR is a video renderer that receives input directly from a decoder like LAV filters. Can you pipe a decoded video output directly to neural-enhance? I didn’t see any mention of that or supported video players. 6. Handbrake, avidemux, makemkv, are not able to make full disc images / backups with menus as far as I can tell. They’re more for transcoding / encoding videos to make them more portable. The other suggestions seem very promising. I’ll have to do more extensive testing to see if they can replace my current workflow. Thanks for that. I’ll try them out. anydvd is my main issue. it IS possible to run a window vm with it in linux mint but it is slightly slower. I am also a heavy outlook user as I run my own exchange server. evolution mail with ews plugin does work but it is not as powerful as outlook with exchange especially when dealing with global address lists and contacts. however it does work ok..
people using outlook for pop/imap would not see much functionality difference. I went on vacation recently and had to use Windows while away. I literally spent over half the time I had available to me to use the computer waiting for Windows to update itself. Unbelievable! I don’t know why people still use that terrible operating system. What a piece of junk! Typically off-topic and wilfully ignorant. 2. I have been on Windows 10 for 7 months. I have never seen a forced update (not one second spent waiting on updates over the last 7 months) b/c I used a simple update disabler cmd script. I like your series of Linux posts here, Mike. But your two choices for image editor illustrate, sadly and painfully, the long way Linux still has to go. GIMP is a horrible, for mere mortals free but also near-unusable present from hell: mainly because its UI is a complete, mindlessly thrown-together mess. No modern basic principles of user-oriented, ergonomic, systematic,logical interface design have ever made their way into this abomination. As for Krita, well, you already suggested why that fork is not popular among average users. What is sorely missing in Linux is a simple but fully functional equivalent of Paint.NET for Windows: a well-designed, capable program for nimble, fast, but complete and effective editing (filtering, etc) of all kind of images. I will thank God on my bare knees the day such a program appears on the Linux horizon. For now, I myself make do with Pinta. While this Linux image editor is too limited in its functions and options, at least it has a workable UI based on normal human conditions. Whenever I need to do some real thorough image editing, though, I still boot my Windows computer. It is exactly this kind of software situation (it’s not just applicable to image editors) that for now keeps preventing a breakthrough in the wider acceptation of Linux as an alternative for Windows. And that is a real pity. I wonder if the Linux is being restrained by patent fences. I suspect that every idea, no matter how trivial, coming out of MS/Apple/Google/Adobe/et al gets patented for protection. There are certainly Linux programmers who could create Photoshop equivalents – if they didn’t have to worry about lawsuits from every direction. That said, I agree with Henk about your Linux posts. They are a welcome addition. Perhaps you should look at XnView. My image editing needs are minimal, but I really need batch capability to reformat many digital photos at a time (a la Irfanview). I recommend the excellent image editing program, Raw Therapee. It has a bit of a learning curve but is well worth it IMO. 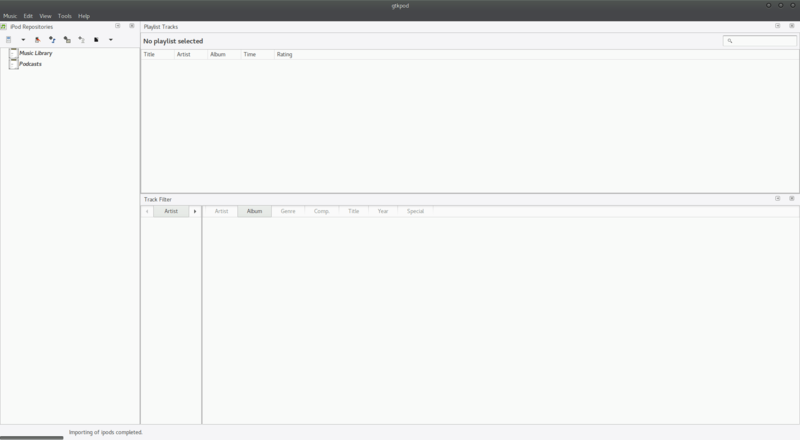 +1 on the unfortunate (and inexplicably) mess that is Gimp’s UI, I’ll give Pinta a try, thanks for the suggestion. Try mtPaint. IMHO it’s better than Pinta for most things. Another alternative for Microsoft office for Linux is Softmaker office. I have it on my WinPc and it runs beautifully. The guys behind Softmaker are also very responsive to questions and pleasant to deal with. I use Playonlinux to play most of my Windows games, and dabbled with “gpu passthrough” to play triple A games, I don’t dual boot anymore because of this. Once in a blue moon I edit videos using Kdenlive and photos with Gimp. Lollypop for my music library, Smplayer for videos and Vlc to play music directly from the file explorer. I like Gimp. It’s free and powerful. I took a course on how to use Gimp at lynda.com and the instructor showed us how we can add addons to make Gimp even more powerful. As a matter of fact he had us install two of them for his course. It’s a powerful app right out of the box but with addons it becomes very powerful. I’m going to have to try out Krita. It looks like it could be a good Linux replacement for Microsoft Expression Design. And I am going to have to try gtkpod. I have an ipad2 that I use for mainly books that won’t load on to my Kindle and for listening to podcasts. To load these books onto my iPad, I have to use an app called CopyTrans in Windows. This sounds like a good Linux alternative. 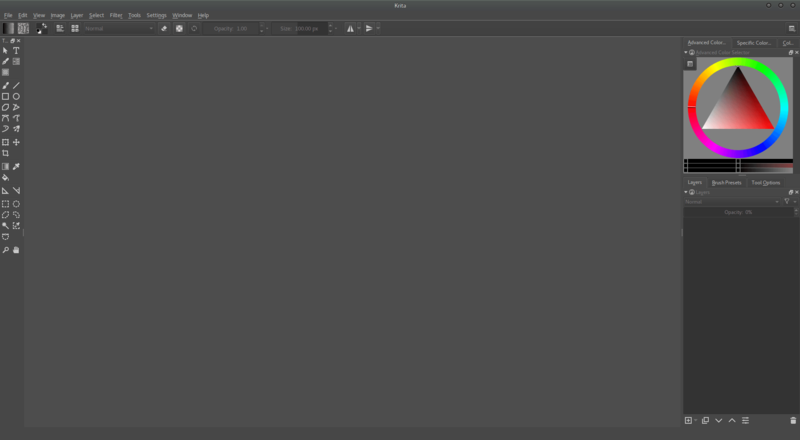 On GIMP, I am with Henk van Setten, but I think he is being too kind to the UI, it is abysmal and the developers seem driven to keep it that way. I have never used Photoshop (PS) but have used Corel-Photo almost since it started and they did stay close to a sensible UI and similar to PS. Also as Henk commented, it is things like this that are holding Linux back from the mainstream. I am constantly grappling with Lazarus and FPC for programming. The devs for those seem hell-bent on adding features without fixing bugs that have existed for years. I am kinda stuck with Lazarus/FPC as I have been programming in Delphi for 20+ years and have zillions of lines of Pascal code. I am retired and only program for friends and fun now, but I’d be happy to pay for windows-like, Linux software. It is no surprise that Linux-et-al, has been stuck at around 5% user-base for as long as I can remember. I love it and will not be going back to windows, but man, they test me almost daily! LOL I have tried many of the Linux flavors but keep coming back to Ubuntu as the least frustrating to use overall. But, it suffers the lack of professional-quality software of the entire Linux world. It’s funny how people like you keep saying that what holds Linux back is specialized software, yet people like you never back it up with numbers. How many PC users use specialized software? I don’t have figures either but I would bet $1000 that at least 60% of PC users are regular users, who just browse the web, play a simple game, etc. I found after a short test that Libre Office displays better under Linux then under Windows. The interface is better proportioned. The icons have the right size. Unfortunately, Libre Writer does not have the outline capabilities Word has in Plan mode. For that matter, no other Windows word processor has them. It’s possible they exist in Mac software. Also with Impress, there’s some formatting issues. It may look good in Impress, but will look like crap in PowerPoint and vice versa. 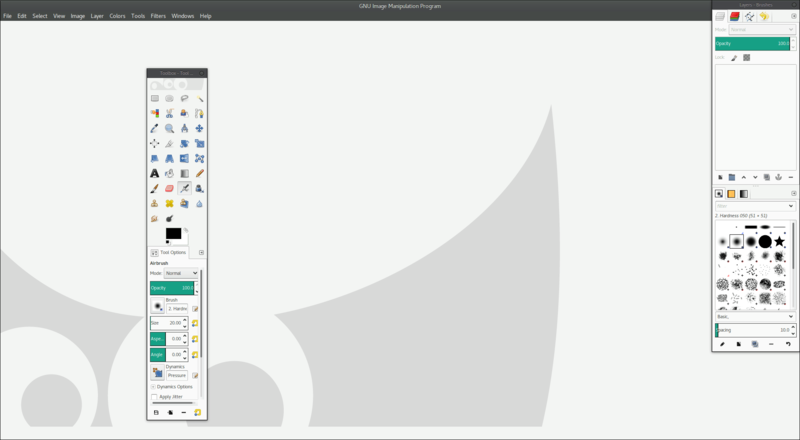 Outline capabilities are present in WPS Office for Linux. At least in the build I’m running. Thanks. I checked the Windows user manual and outlining is there too. Although it should be put to test in order to determine whether it’s really up to the task. There are many different ways to implement outlining, and even the Word method (which is among the best) leaves a big margin for enhancement. However, WPS Office… ? Where are the support, the environment, the forums, the tutorials, the books ? I couldn’t even find the file format in the manual. That’s the problem with also-rans. I wouldn’t feel safe committing myself to such an obscure piece of software for such a core application. The file format is doc/docx, just like MS Office. Yes, yes, Heimen Stoffels, I’m a troll because I call WPS Office obscure. I’ll tell you something as silly, offensive and rude as what you’ve just written : you’re a racist because you don’t like Microsoft Office. See ? I can do it too. Now I’m sorry I thanked you for pointing to WPS Office and thinking you were here for a bona fide conversation. I actually like Gimp more than Photoshop, it has a few handy options that PS doesn’t (but of course doesn’t have many others). For a while I missed PS but after a year I tried it again and didn’t see it as much better, especially the UI. Since I’m not a graphic designer (even though I have finished a Photoshop course), I’m satisfied enough to have fun with it. I have a very large music collection with all properly sorted metadata, artwork etc, and I use Lollypop to play music. Tried them all and for my needs Lollypop is the winner. LibreOffice is NOT compatible unless you create basic documents. It fails to render complex Word documents close to original. In Excel, I has no equivalents for lots of formulas, macros do not work too, color pallete is different etc. Some months ago I wrote macro driven generator in Excel, which worked flawlessly in various versions of Excel, and to make the workbook with formulas (not macros!) compatible with Calc took twice the time as writing all macros and the cost of this was around the same as buying MS Office license. And we are talking only about one workbook. So open source is not cheaper. It is only worse. That’s it. P.S. GIMP? I worked with it on Windows only. Missing features, bugs, crashes…not anymore. Will rather pay for decent pro editor. The steps Microsoft has taken to obfuscate proper third-party implementations of their .docx file formats are well-documented at this point. The fact that Microsoft has made it difficult for any other office suite to format their files directly is hardly anybody’s fault but Microsoft’s, and actually, the fact that LibreOffice renders as well as it does is nothing short of impressive. That was not my point. I disagreed with statement in article that LibreOffice is fully compatible with MS Office, which is not. Old Excel palette has 56 colors or so. These are documented. Still not rendered correctly in xls format. One more example: Eastern European character at the beginning of sheet name and formula referring to this sheet on another sheet. Broken. Charset is also well documented. And…regarding obfuscation…are you serious? Office suite generates a lot of money to them. Why should they provide file format documentation to third party developers for free? BTW. There are open source document formats available to any developer for free (odt, ods etc.) which were introduced with hopes to replace Office formats, but I have never seen any such file created by someone. Is this Microsoft’s fault too? This is “an egg comes first or chicken comes first?” situation, ie similar to Win 10 Mobile dying because of lack of useful Apps = caused by a minuscule market share of about 2% and decreasing. ……. In comparison, there are thousands of Apps available for the more popular Android and more trendy iOS. ……. Like they say, “There is no free lunch in this world”. Open Document Format (.odt) came before Office Open XML (.docx). I think a more careful reading of history will show that .odt was one its way to supplanting the legacy .doc format, but Microsoft rushed to get .docx standardized to prevent such a loss of control. If Linux run games easily,windows die in seconds…..
Linux does “run games easily” — ever heard about Steam for Linux? @Martin Brinkmann: which Linux distribution do you use ? At this moment I do not feel comfortable enough to use a Linux distribution as main OS. I hope there comes a time to make the switch from Windows towards Linux. In the past I did install Linux Mint in a virtual machine, but it was slow. I did not really work with software, like Gimp, LibreOffice, and so on. I am of course not Martin, but I, like you sat on the fence for several years. I frequently dabbled with Ubuntu and Mint in a VM, but again, like you I found them slow. That was more the cause of the VM than a Linux distro. I can’t recall exactly what finally pissed me off about windows 8.1 one day, but about a year back I decided to jump. It took about there weeks to get past the learning curve. It was not that hard as long as you use quasi-compatible mainstream items to keep you working with day to day stuff. Firefox, Thunderbird, Libre Office etc all are pretty intuitive and close enough to windows to give you some breathing time for experimentation. Installing software can be difficult, in fact, often downright complex, but Linux is based around great security so with that comes a price. Debian-based distros like Ubuntu have their own installer format with .deb files that takes a lot of the sting out of trying new software. Unfortunately only about 50% of software is packaged as .deb files. But, my suggestion to you is if you think you will switch to Linux, just do it — now! A few days back I had to do some recovery work on a friend’s windows laptop. I could not believe how slow and cumbersome it all was. GIMP workflow is a disaster at best, example: try adding text to an image and compare that to Photoshop or even something like Faststone. GIMP ranks as the least user friendly software I have ever used, not exaggerating. The Office alternatives are so so in my opinion, could be worse. In terms of character handling and encoding and such, try eastern European names in an English document using LibreOffice. In 2017 we shouldn’t be having such shortcomings. Video editors: Davinci Resolve, Lightworks, Kdenlive. Audio editors: Audacity, Cecilia, Mixxx. Media Players: SMPlayer, VLC, MPV. Photoshop: Krita, Darktable, Pixeluvo, LightZone. Graphics: Blender, Inkscape, LibreOffice Draw. Is there an MRI (Magnetic Resonance Imaging) image viewer for Linux that works as well as the Windows software they give you from the imaging labs? One that will show you position in the overall body part as well as the detailed images from that location? Ginkgo CADx (DICOM viewer) is excellent, great for all types of digital images. GIMP still lacks, but has come a long way (specifically adding the single window ui option). I still have a copy of PS CS2 though, but a lot of stuff built with newer version of PS are not compatible. I quite like DeaDBeeF as an audio player. Excellent DICOM viewer for MRI CD/Images. In my mention this program has not equal software under linux. Very fine quality of picture, comfortable, usable. If you don’t dual boot then you will force yourself to use programs other than what you know. Is an app available on Windows really a Windows alternative? I run Clementine on Windows 10. LIbreOffice is the umpteenth derivation / fork of an alternative to Office and yet they still haven’t tables in Writer to be usable. Articles like this are so ridiculously common it’s really bad form. Along comes some source of pro-Linux propaganda and what do they do? Always give that prima facie glance as if talking so gently to the average user who might just have zero Linux knowledge and yet is toying with the idea of trying Linux. The articles completely lack any decent level of journalism. They’re just unofficial press releases stating the “me too” factor for Linux as if the various flavours/forks/versions of mainstay, very mature and sometimes even reliable Windows apps actually have an equivalent Linux version. The truth is much more detailed than that. These ‘alternatives’ are often buggy. Inadvertantly this article reveals the more accurate truth behind Linux: many of the apps are developed by crowds of people with minimal organisation, sometimes even anarchic behaviours and structures, and for all the truly heroic efforts of every FLOSS coder who donates their time, often a huge bulk of the work is paid for by a sizeable corporation (“Social Enterprise” if we’re lucky) before the software becomes reasonably polished. The problem there is the apps that have minimal funded developers and could fork off the software if enough devs wake up on the wrong side of the bed one morning, tends to be presented on face value in articles like this as equivalent to Windows apps with fixed, long-term funded development models producing genuinely polished, tested, highly-mature software. Don’t get me wrong, FLOSS (or whatever variations of the alphabet they’re using these days) is changing the world in many cases fundamentally for the better. I just expect much more significant analysis from ghacks rather than “hey, I’m the Linux guy, never write about anything else, but I’m not biased … and hey, Linux has apps that are just as good as any Windows versions”. Or worse, the classic: “Linux has WINE so everything of Windows works just fine under Linux”. At least this article didn’t state that. On the contrary, it effectively states Photoshop is (surprise, surprise) *buggy* under WINE. How many other apps are also buggy when run under the incredibly long-running WINE project that has never seemingly reached it’s goal of allowing bug-free, easy emulation of Windows APIs. 2. OMG linux freezes every now and then, wasn’t linux advertised as the OS servers ran for a year without needing to reboot? 3. OMG weird spike in network activity like >100MB around midnight everynight after I had turned off updates. Was linux dialing back home, uploading everything I had done that day? Was my computer being used as some large botnet? I would never have known except when I carefully monitored network activity. Lots of folks incorrectly assume that Linux should be like Windows. Why would it? It’s like the difference between a cat and a dog. They both have hair and 4 legs but then the similarities stop. Thank god. When the Linux’s I use start being like Windows I will walk away from PC’s. The majority of the populace has been so inundated with Microsoft in their day to day they think everything should work like it does on Windows. I submit to do that then the devs will have to do the things that Microsoft or Apple has done. Then Linux would not be free. The day to day things I do on my desktop are to me more comfortable in Linux than Windows. I typically spend a good deal of time on front and back-end development with node.js. Doing that in windows is like having a hand tied behind your back and 3 fingers of the other hand taped together. And yes I have tried it repeatedly. Everybody had a learning curve for Windows so your going to have one for Linux. That curve is simply learning what tools you use in a different OS to do what you did in another one. If you fear learning then by all means stay away from Linux. If you’d rather pay money so somebody else can tell you what to do with your PC then by all means run Windows. But don’t knock Linux or it’s software if you haven’t done do diligence in learning to use it. Most definitely don’t start trying to use it and think it ought to be like software on Windows. If you used Linux while you were still in diapers like most people did with Windows then Windows and it’s software would be as strange to you as Linux is to the average user now. There’s a very good reason why Linux should be like Windows, which should be like Apple, etc : all of them are used by men, whose eyes, hands and brains work the same way. There is not an infinite number of ways to interact efficiently with a computer. We should have found the best way by now. It is normal, and desirable, that many things would be done the same way on all computers. All chairs are basically the same. There are many companies designing screwdrivers, but none of them do it very differently from others, because the screwdriver is mostly dictated by the screw and the human hand. You are a developer. Most people who use computers are not. This is a specific activity with (I suppose) specific needs. Also, the price is irrelevant. It’s a different issue. The way you can fund good software development is another discussion. Besides, Windows 10 is free. Google is free. Google is not a lesser search engine because it is free. I have used free programs which are terrific, free programs which are very poor, and paid-for programs which are unusable. Strange thing is though that with Windows being so popular I initially expected that everyone would ditch their Android phones for Windows phones, but that never happened. So there are areas where people don’t mind running something that’s similar (because let’s face it: Android is very different from Windows (Phone)) and learning something totally new. > Besides, Windows 10 is free. Google is free. Nothing is ever FREE, so quit that brainwash, now. There’s a cost later on down the line that you will pay for with these trifling goodies. Google and Micro$oft are in the business to make money. They didn’t give away this stuff because they are benevolent nice guys and want to be your friend. You will pay them back with the information you give them. You are now their product. You are no longer their customer. And once total vendor lock-in is achieved, expect to pay subscriptions for your folly because they’re gonna want something more back from you in return. In one form or another. but i dont catch you; what is the value of this news as it’s a repeat; you seem not to have ideas. my opinion on gimp: as a daily user of photoshop i know the difference. I try a lot of softs, including krita, mypaint and gimp and got them installed on my PC. Gimp is the worst thing ever produced; nowadays there are missing features and it probably took decades to see a powerful gimp. So when you work you need the right tools and you don’t have to much time. libre office had made lot of progress (real good job) but not enough to be as fast and handy as MS office is. try a soft to shorten your phrases. be english friendly. I have had great luck with Debian Linux for the last two years. Redshift is the Linux version of f.lux for tired eyes. Keepassx, Audacity, VLC player, Firefox, Thunderbird email, Image Magick for photo editing and I’m all set. There are hotkeys that can be customized built into the system if you use Gnome. I still have Windows 10 on a test machine I rarely use. The deal breaker for me is the long updates. Linux takes a couple of minutes at most. I appreciate the rock solid reliability of the stable version (Jesse, at the moment. ‘Stretch’ will be finalized in a month or so)…not a gamer. Linux is much more polished now than the clunky experience I had with it a decade ago.